Jacob Stockdale: Ulster fans are incredible! 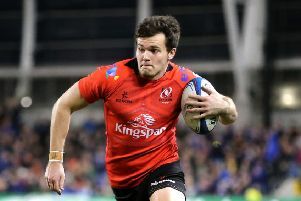 Ireland and Ulster winger Jacob Stockdale said he was humbled by the way supporters rallied behind him in the wake of his try fumble during the European Champions Cup quarter-final loss to Leinster. The prolific try scorer in both white and green over the past two seasons dropped a ball over the line during the last eight game between the Provinces at the Aviva Stadium last month. Ulster lost the game 21-18 and Stockdale still feels he cost his side a place in the semi-finals even though he has been told by many people he did not. Shortly after the final he posted an apology to fans on his instagram account and he said he was amazed by the response and support he had got. Jacob Stockdale: Ulster winger will be diving over to score next time!